A Turkish court has arrested 24 workers after protests over labour conditions at the construction of İstanbul’s new airport. A Turkish court on Wednesday ordered 24 workers and union activists to stay in jail after they were detained in a mass crackdown over protests on working conditions at İstanbul's new airport. Police and gendarmes fired tear gas at a workers’ protest over poor working conditions during the construction of Istanbul’s new airport, a showcase mega-project for President Recep Tayyip Erdoğan’s government. The workers began strike action early on September 14, Friday and the number of protestors increased during the day. The Union of Construction Workers said on Twitter that workers were on strike because of the increasing number who had lost their lives or been injured as a result of workplace accidents, and due to worsening working conditions as authorities rush to open the airport on Oct. 29. “In the last couple of days, two of our friends fell from the roof, one of them is right now in surgery. Our working conditions are horrible,” one worker told Evrensel. Two shuttle buses carrying airport construction workers crashed this week injuring 17 people. Workers complain they have to wait for hours in the rain for shuttle buses to arrive to take them to and from work and say their dormitories are full of bedbugs and fleas. According to the workers, many sub-contractors working on the project have gone bankrupt as a result of the Turkish lira dropping by 40 per cent this year and have left the project without paying wages. “Those working for the prime contractor are being paid, but most of those working for sub-contractors cannot get their salaries,” one worker said. “You say this is a world project, but then you fail to feed your workers in a sector earning millions of dollars,” said another worker, explaining that workers recruited by sub-contractors were not allowed to eat at cafeterias on the site. The airport, set to be the largest in Europe, is being built by a consortium of Turkish companies with close links to the government. “The workers are not even allowed to go to the toilet. We do not even have refrigerators. We are taking showers by using the water coming from ponds near the constructions site,” another worker said. A union representative told Evrensel that workers who had been filming the protests were threatened. Some 30,000 people work at the construction site. 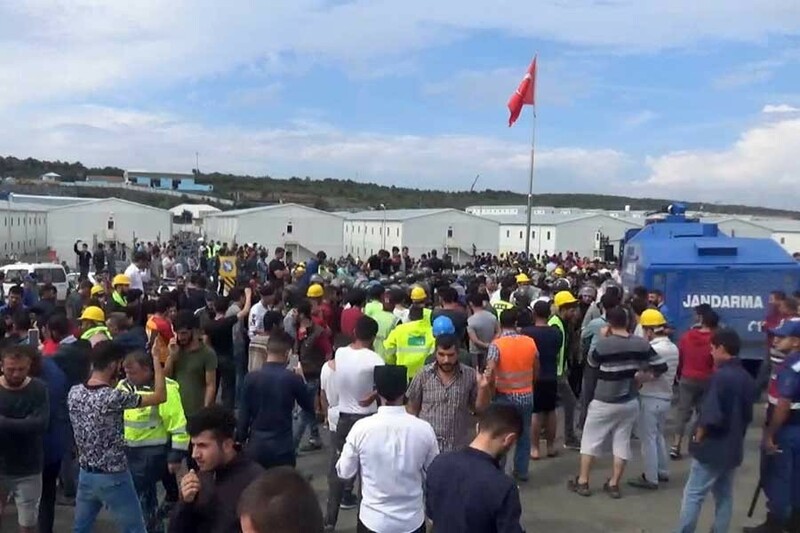 On Saturday morning Turkish police and gendarmes launched an operation in the construction site and detained more than 500 people, including workers and trade union representatives, who commenced the strike.